Posted on February 17, 2011	by Derek "Gamer Crash"
Making the Case returns this week with an absolute gem available for download over the Playstation Network. As always, I present the facts and you make the decision. 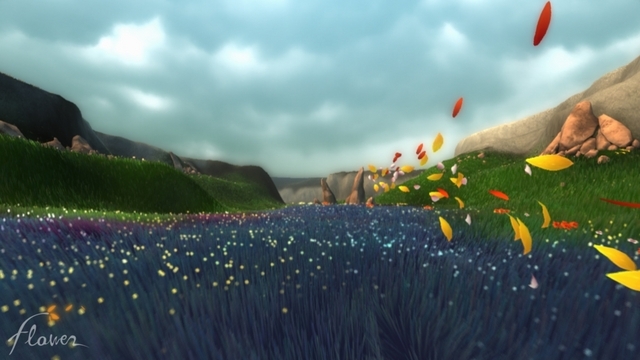 Up this week: Flower for the PS3 and Xbox 360. Chances are, the majority of you have never considered what kind of dreams flowers may have. Not that I’d blame any of you as that would be kind of odd. Thankfully though, we do have a game that shows us what it would be like. Thatgamecompany crafted what is easily one of the most breathtaking and fun games that have come along in recent years. It also proves to be one of the most relaxing gaming experiences out there as well. With some amazing visuals, Flower proves to be a powerful game. With that said, the gameplay may be a little too simple for some as it strays pretty far from the traditional. In my opinion, it’s still 100% worth playing. Details after the break. Flower begins on a window sill with a potted flower overlooking a colorless city. Each flower’s dream or level involves a different theme but the gameplay and control scheme remains the same. 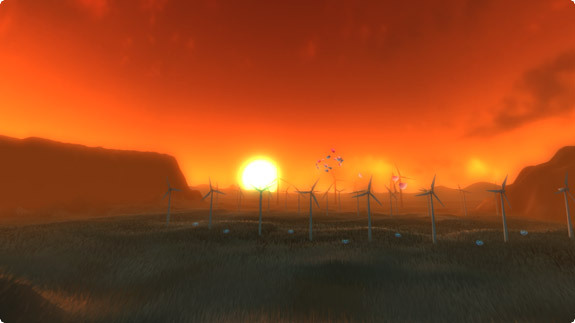 The player uses the wind to move a single petal through the level. The ‘X’ button makes the wind blow and tilting the controller will guide the petal through the level. You’ll soon touch other flowers with each one adding an additional petal to your trail and influencing the land around you, performing tasks like adding colors, opening new areas to explore, and even changing land formations. It’s such a simple gameplay mechanic but it works so well and is completely engaging. Each dream has a start and end point, so it can be a bit linear in it’s progession. I’m not really a motion control kind of guy. I don’t have Kinect or Move, and I only generally like Wii games that don’t feature a ton of it. After playing Flower, I’m a believer. It only takes a mere moment to fully grasp the game and the controls itself feel great. Things react properly, the petals move where you want them to, and it’s just a ton of fun to help guide them. In a nutshell, that’s basically all there is to it. There’s not much outside of what I just mentioned. The game isn’t really all that challenging and it’s pretty short at around 2 hours (obviously longer if you hunt for the game’s secrets and trophies). Here’s the genius part though. It’s the experience that outweighs everything else. The colors are vibrant and stunning, the controls work wonderfully, and you’ll want to play this one multiple times. If you’ve had a hard day at work, or are stressed, Flower will just melt it right off you. There’s nothing quite like guiding flower petals through tall grass and just watching it bend and move. It’s so serene. Certain dreams feature gameplay elements that add a new layer to the game. For example, in the second dream, the player can change their petal color to three different types. Doing this will allow the player to “paint the grass” as they blow over it. This is completely optional and unobtrusive but totally enhances the gameplay as you can paint the entire valley as you see fit if you want. My favorite is the fourth dream where it’s night-time and you are able to illuminate objects and even the grass around you as you blow over them. It’s a visual treat. The music is also a high point of the game. Matching the relaxed atmosphere perfectly, the music is composed of multiple layers that sync with what the player is doing in the game. Expect a lot of pianos, chimes and wind instruments. The best part is that flying over specific flowers will also give off a sound from one of the instruments as well. Overall, Flower is a short but oh-so sweet gaming experience. That’s exactly what it is, an experience that I would whole heartedly recommend to any gamer. It doesn’t have much in the way of a challenge, but if you’re interested in trying something so unique and powerful, Flower is a safe bet. As a spiritual successor to flOw, Thatgamecompany has crafted another masterpiece. Hey, if anything, it’s a good way to relieve some stress and decompress. So just relax and enjoy. This entry was posted in Making The Case and tagged games, Opinion, PS3. Bookmark the permalink.